Jersey, a British Crown Dependency in the English Channel off the coast of Normandy in France has a total land area of 45 square miles and a population of over 90,000. The country has third highest GDP per capita in the world. This is mainly due to its highly lucrative financial services sector. Other economic contributors are tourism, electronic commerce and agriculture. Potato, apples and dairy are the contributors in the agriculture section. 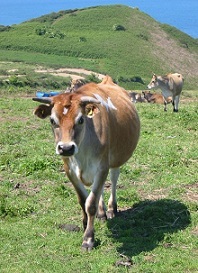 Jersey cow is known the world over for its rich cream and milk. Jersey cuisine is seafood based – mussel, oysters, lobsters and crabs being the main entrees. Jersey Visitor’s Map 978-1553415947 $13 Jersey 1:12,000 scale and St. Helier 1:7,000 scale. Jersey Berlitz Pocket Guide 978-9812687067 $10 144 pages - Good coverage of places including full-colored fold-out maps. Before 1969, British stamps were used in the territory. The first stamps of Jersey were a set of six stamps released between 1958 and 1969. The set (Scott #1 to #6) catalogs for around $2 MNH or used. The design shows a portrait of Queen Elizabeth II along with the Royal Mace and Arms of Jersey. The set is considered a British Regional Issue that was sold only in Jersey but could be used throughout Great Britain. A set of fifteen stamps released on October 1, 1969 primarily showing local scenes. The set (Scott #7 to #21) catalogs for around $35 MNH and $25 used. The designs show a QEII portrait along with the following: La Hougue Bie, Portelet Bay, La Corbiere Lighthouse, Mont Orgueil, Arms of Jersey and Royal Mace, Jersey Cow, Map of English Channel with Jersey, Mont Orgueil, Airport, Legislative Chamber, Royal Court, and a Queen Elizabeth II photograph by Cecil Beaton. La Hougue Bie is a Neolithic ritual site from the 3500 BC time period – it is considered one of the best preserved tombs of Western Europe. La Corbiere is a lighthouse at the southernmost point of Jersey – it is one of the most photographed landmarks in Jersey. Mont Orgueil is a 13th century castle in Jersey overlooking the harbour of Gorey. A set of four stamps released on March 9, 1971 showing local fauna. The set (Scott #49 to #52) catalogs for around $8 MNH or used. The designs show white-eared pheasant, thick-billed parrots, Ursine Colobus monkeys, and ring-tailed lemurs. Jersey has released several other sets (flowers - Scott #61 to #64, animals - #65 to #68, marine life - #91 to #94, birds - #129 to #132, etc) featuring flora and fauna which are all valued in similar ranges. A set of twenty six stamps released between 1989 and 1995 showing Arms, QEII, and local scenes. The set (Scott #477 to #506) catalogs for $30 MNH and $30 used. The designs show Belcroute Bay, High Street at Saint Aubin, Royal Jersey Golf Course, Portelet Bay, Les Charrieres D’Anneport, Saint Helier Marina, Saint Ouen’s Bay, Rozel Harbor, Saint Aubin’s Harbor, Jersey Airport, Corbiere Lighthouse, Val de la Mare, Elizabeth Castle, Greve de Lecq, Samares Manor, Bonne Nuit Harbor, Grosnez Castle, Augres Manor, Central Market, Saint Brelade’s Bay, Saint Ouen’s Manor, La Hougue Bie, Mont Orgueil Castle, Royal Square, QE II at Coronation, and Royal Arms. A set of four stamps released on April 27, 1999 in the National Parks theme. The set (Scott #897 to #900) catalogs for around $4 MNH and used. The designs show Howard Davis Park, Sir Winston Churchill Memorial Park, Coronation Park, and La Collette Gardens. It was released at the International Philatelic Exhibition in Nuremberg. Another set in the philatelic theme soon followed in 2000. The set features works of Children’s Stamp Design Contest Winners. The designs show Ocean Adventure by Gemma Carre, Solar Power by Chantal Varley-Best, Floating City and Space Cars by Nicola Singleton, and Conservation by Carly Logan. The first coins of Jersey were British Dependency Standard Coinage introduced in 1841. The first issue was a Copper 1/52 Shilling (13 Jersey Pence = 1 Shilling, 12 Pence = 1 Shilling, 5 Shillings = 1 Crown, 20 Shillings = 1 Pound, 100 New Pence = 1 Pound) with mintage in the 100,000 range valued at around $350 UNC. Jersey started issuing commemorative gold coins in 1972 in different denominations up to hundred pounds. Coins $1 and up Recent UNC pennies starts around $1. Recent proofs start around $5. Commemorative Silver Proofs starts around $30. WWII Silver Two Pound Piefort Proofs, Silver Proof Sets, Gold Proofs, etc go well into the 100s. Paper Money $4 and up Common Jersey Poundage in UNC starts around $4. Specimens from the 2000s and low serial numbers start around $15. High Value Specimens and Serial Numbers start around $30. German Occupation Issues in VF, UNC Specimen Sets etc go well into the 100s.